Quite a bit has happened since the new year. I tasted a lovely Red Velvet cupcake from Sprinkles courtesy of GS and NCT who introduced the Newport Beach outlet of the chain to me(review coming up next). Oh and I’m currently technically unemployed….the story is terribly complicated and you really don’t need to know all the gory details via this avenue. So the Sprinkles experience left me very inspired since it was oh so yummy and cute and a tad on the pricey side. I wanted to have tasty cupcakes I could eat most days and not feel guilty about shelling out $3.25 for it. The current employment status has left me with quite some time to ponder about my career path, ability to start to make some changes to head towards something new and of course plenty of time to test out recipes and batches of what I hope to be something I’d feel guiltless (at least money wise) when eating. So after scouring the inner depths of the Internet for recipes I came across a recipe adapted from Paula Dean which I then also changed to suit my own tastes. I added some more cocoa and vanilla, cut back on the red dye and played around with the oil to butter ratio. For the frosting I cut back on the sugar since I like a more blander sweet. In a medium mixing bowl, sift together the flour, sugar, baking soda, salt, and cocoa powder. In a large bowl gently beat together the melted butter, oil, buttermilk, eggs, food coloring, vinegar, and vanilla. Add the sifted dry ingredients to the wet and mix until smooth and thoroughly combined. Divide the batter evenly among the cupcake tins about 2/3 filled. Bake in oven for about 25-30 minutes, turning the pans once, half way through. Test the cupcakes with a toothpick for doneness. Remove from oven and cool completely before frosting. Combine cream cheese, butter, vanilla and sugar in a food processor and pulse just until smooth and creamy. If the frosting is too stiff, pulse for a few seconds longer. Do not overprocess. If desired, stir in additional flavoring to taste. In a medium bowl, beat cream cheese, butter, and vanilla until blended. Add sugar one-third at a time and beat just until smooth and the desired consistency. 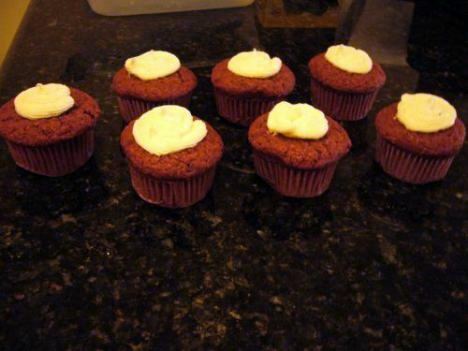 If frosting is too stiff, beat for few seconds longer. Do not overbeat. If desired, stir in additional flavoring to taste. By no means is this cupcake *The Cupcake*. I’m satisfied with it however and will continue to tweak. It is quite moist but I’d like to play around some more with the density and the cocoa flavor.